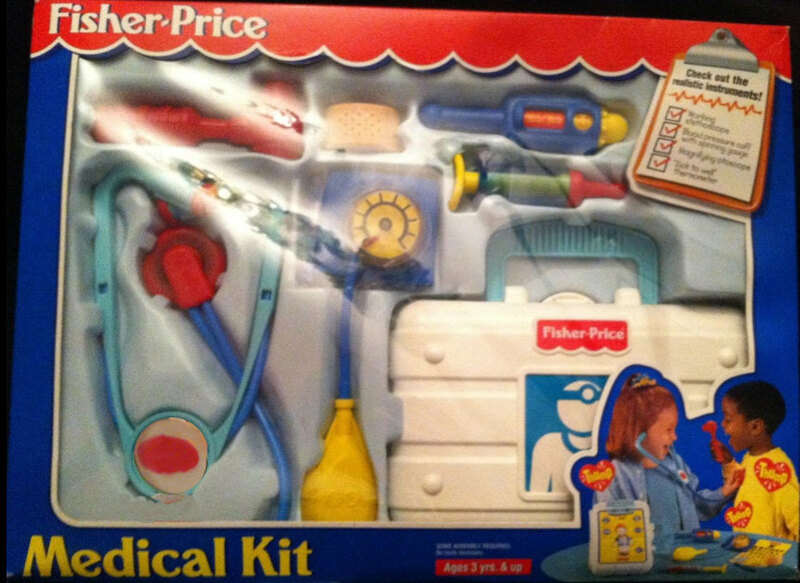 Description: Children love to play doctor, and this kit is perfect to encourage imaginations, and to introduce young M.D. 's to the tools of their trade. The set comes with several plastic doctor tools, such as a blood pressure cuff with a spinning gauge, a stethescope that "shows" a heartbeat, a syringe, bandair, and more! All of the accessory pieces store neatly into the accessory white plastic medical bag. The medical kit has been a long-loved and long-lived set from Fisher-Price, beginning in 1977 with the #936 Fisher-Price Medical Kit. The 936 was replaced in 1987 with #2010 Medical Kit. Although the set has changed a bit over the years, it still has wonderfully crafted medical tools and accessories. Designed for children ages 3 years and older. FPT15573 - Medical Case - White rectangular plastic medical case with a hinged light green carry-handle on the side. One side of the case has a square green litho with a white doctor design. Other side of case has a yellow lithograph of a boy and lines pointing to various areas on his body - anatomy chart. Children can write on the anatomy chart with a crayon and wipe it clean when finished. The top of the chart has a clipboard with a slot to store a crayon. FPT15574 - Stethoscope - Aqua wishbone-shaped plastic connectors with red ear tips on the end. Has blue flexible hoses and a round red tip with black sponge on the back that really picks up heartbeats! The center of the aqua connector has a round section with a red heart in the center that appears to "move" when "listening" to a heartbeat. FPT14413 - Syringe - Clear (blue-tinted) plastic syringe needle case with a red pretend needle on one end and a yellow push-in knob on the other end. When the knob is pressed in, it covers the red "medicine" inside the syringe. FPT14372 - Blood Pressure Cuff - Blue cloth cuff that fastens around a child's arm with Velcro® brand fasteners. The cuff has a round clear plastic cover with black line markings. The cover protects a round yellow dial with an orange arrow that spins when the yellow squeeze bulb is squeezed. The squeeze bulb is attached to the dial via blue flexible hose. The bulb is marked with a molded "f" and "p" within circles. FPT15575 - Thermometer - Blue themometer with a yellow dial on one end that changes the reading on the themometer. The themometer reads "86.6/37.0" with a picture of a smiling face, 00.0 with no face picture, and "101.2/38.4" with a picture of a frowning face when the dial is turned. FPT15578 - Otoscope - Red otoscope (ear/throat light). The otoscope has a round head with a hole in the center and with one tapered end to fit in an ear. The handle is round with a narrow neck area near the head and with raised rings on the large end. FPT7613 - Band-Aid - Flesh-colored (pink/tan) plastic C-shaped pretend band-aid that can snap onto a child's arm. FPT15576 - Eye Chart - Yellow cardboard eye chart with blue trim on the edges and a picture of a little girl playing doctor pointing to the letters on the eye chart. FPT15579 - 1 blue crayon to write examine reports on the medical chart. FPT15580 - Sold in a 18-1/8" long, 13-1/4" high, 2-1/4" deep open display box. 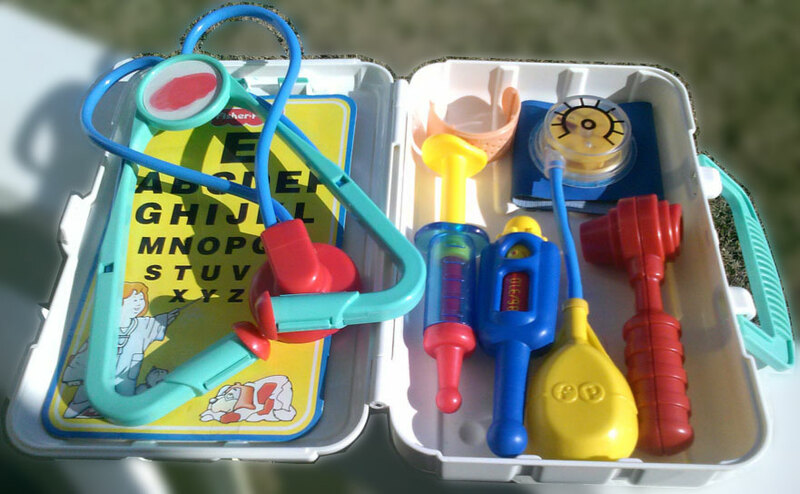 Also see 1977-1986's #936 Fisher-Price Medical Kit. Also see 1987-1997's #2010 / #72010 Medical Kit. This set was replaced with #77810 Medical Kit (2001-2010).